TURKISH leader Recep Tayyip Erdogan has won another term in office and gained far-reaching presidential powers but his reactionary AKP party has been forced into coalition with another right-wing bloc after failing to gain an outright majority in parliament. The ruling Justice and Development Party (AKP) now has to continue in coalition with the Nationalist Movement Party (MHP), following snap elections that the opposition says were deeply flawed. Turnout was a high 88.1 per cent and the result shows that Erdogan’s brand of populism, nationalism and conservative religious values remain robust. Yet the election showed a strengthening of the opposition. Adam Schiff. a right-wing Democrat Congressman from California said “Erdogan ‘won’ re-election in Turkey this weekend only by decimating the opposition through arrests, violence and squashing freedom of the press. 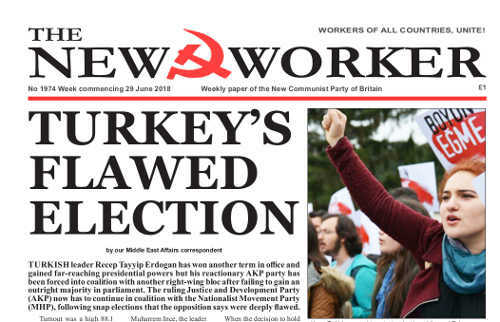 Turkey’s descent into autocracy is another reminder that democracy is under assault worldwide”. As Schiff is a supporter of the Armenian-American lobby, whose loathing of Turkey goes back to the massacre of some two million of their ancestors by the Turkish authorities during the first World War, his remarks are not surprising. HS2 HAS announced plans to deliver an “unprecedented” green corridor to run alongside the £56bn high-speed railway, to create a network of environmental projects from the capital to the north of England. But the Woodland Trust has hit back at the plan by saying that the only unprecedented part of the railway is the amount of ancient woodland it will destroy. And the tree campaigners likened the plans to “smashing a Ming vase and replacing it with bargain basement crockery”..
LABOUR leader Jeremy Corbyn has said that the next Labour government will recognise Palestine as a state. Corbyn, on a tour of Palestinian refugee camps in Jordan, said that a future Labour government will recognise Palestine as a state as one step towards a genuine two-state solution to the Israel—Palestine conflict. He also criticised the Trump administration for recognising Jerusalem as Israel’s capital and called the moving of the US Embassy there a “catastrophic mistake”. At Labour’s annual conference last year Corbyn received his longest and loudest standing ovation when he called for an end “to the oppression of the Palestinian people” and Israel’s “50-year occupation and illegal settlement expansion”. No-one, apart from the most rabid Zionists, would disagree with Corbyn’s sentiments..
Read the full editorial here >> Corbyn on Palestine !